Venezuelan President Hugo Chavez says he has frozen his country's bilateral ties with neighbouring Colombia. The move follows the decision by Colombian President Alvaro Uribe to end Mr Chavez's role as a hostage negotiator with Colombia's Farc rebels. 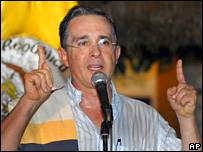 Mr Chavez said that the decision to end his mediation role was "a spit in the face" and denounced Mr Uribe as a liar. He also said he had frozen relations with Spain over a remark made by King Juan Carlos earlier this month. The king told Mr Chavez to "shut up" after the Venezuelan leader repeatedly interrupted the Spanish Prime Minister, Jose Luis Rodriguez Zapatero, during the final session of Ibero-American summit in Santiago. Mr Chavez later said the matter would be settled only if he received an apology from the king, whom he accused of "arrogance" and "impotence". But Venezuela's ambassador to Spain, Alfredo Toro, played down the spat after meeting Spain's top foreign ministry official for Latin America, Trinidad Jimenez, on Monday. "The two countries have a common future beyond ups and downs," Mr Toro said. Ms Jimenez said Mr Toro assured her there was no change in the countries' bilateral relations. The harsh exchange of words between Venezuela and Colombia began on Saturday, when President Uribe insisted he had ended Mr Chavez's involvement in the negotiations for speaking directly to Colombia's army chief despite being told not to do so. "They issued a statement yesterday filled with lies, and that is serious, very serious," Mr Chavez responded - in marked contrast to his reluctant acceptance of the initial announcement on Wednesday. "President Uribe is lying, and he's lying in a shameless way," he said. The Venezuelan leader said Mr Uribe had lied about the reason for the failure of the talks in order to avoid seeking a peaceful solution to the 40-year-long armed conflict with the Farc. "They have spat brutally in our face when we worked heart and soul to try to get them on the road to peace," he said. Mr Chavez said he had therefore decided to freeze Venezuela's relations with its neighbour and second-largest trading partner. "I declare before the world that I'm putting relations with Colombia in the freezer because I've completely lost confidence with everyone in the Colombian government," he said. "Everyone should be on alert with respect to Colombia," he added. "The companies that Colombians have here, the companies we have over there, commercial relations - all of that will be damaged. It's lamentable. "It's like the case of Spain - until the king of Spain apologises, I'm freezing relations with Spain." The BBC's Jeremy McDermott in Bogota says President Uribe wasted no time in responding to the onslaught from his Venezuelan counterpart. His attack on Mr Chavez was less personal but equally devastating, our correspondent says. Mr Uribe accused the Venezuelan leader of not being interested in promoting peace in Colombia and insisted that Venezuela had expansionist plans that Colombia would resist. 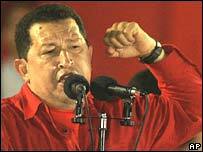 "The truth is, President Chavez, we need mediation against terrorism, not one that legitimises terrorism," he said. "Your words, your attitudes, give the impression that you are not interested in peace in Colombia, but rather that Colombia be a victim of a Farc terrorist government," he added. "If you are spreading an expansionist project in the continent, in Colombia this project will make no headway." The Colombian president said Mr Chavez had attempted to "set the continent on fire" by attacking Spain and the US, and by "mistreating" Mexico, Peru and Bolivia. "You can not mistreat the continent, set it on fire as you do, speaking about imperialism when you, on the basis of your budget, want to set up an empire." Who is being held and what are the chances of more releases?